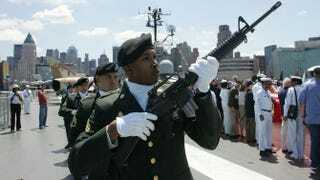 A military squad prepares to fire a salute aboard the USS Intrepid during a Memorial Day service May 30, 2005, in New York City. Memorial Day is a sacred occasion when we pay tribute to all the military men and women who have died in service to the United States. It is also an observance that owes its creation to blacks. This tradition began when newly freed slaves decorated the grave sites of Civil War soldiers as a way to honor those who had fought for their freedom. But blacks were not just passive bystanders. Many of volunteered to serve in the military, ensuring they were active in reshaping the United States to be truer to its founding principles. It is for this reason that Memorial Day should hold special significance for all black Americans, but especially for those who are veterans or serving in the military today. As the country memorializes the men and women who made the ultimate sacrifice, it is important to remember that thousands of them were black Americans who were treated as second-class citizens in the country for which they fought. But they voluntarily served, anyway, because of their belief in their and in the hope that their display of devotion to the nation would result in gains for all black Americans. From the Revolutionary War to the current conflicts, black men and women have served with dignity and honor. And many would not or could not live to see the progress the country has made. Black service members have lived in a United States where their people were lynched, segregated and forbidden any involvement in the political process. Yet they still went off to battle because they believed black people would never be equal in the United States if they didn’t fight for it. And they were right. Much of the nation’s progress on race is a direct result of black Americans’ volunteering for military service, even if it meant death, and performing exceptionally in the process. The gains that black people have made over the past two centuries are not a result of America’s benevolence, but of black Americans’ willingness to risk life and limb for the country’s preservation. Before there was Brown v. Board of Education and the Civil Rights Act of 1964 outlawing racial segregation, there was an executive order from President Harry Truman in 1948 that began the process of desegregating the military. Though this was but one incremental step of many toward a national policy of desegregation, it was the performance of blacks in the military, particularly their distinguished service in World War II, that made this order possible. Today, we black Americans serving in uniform can be proud of our ancestral and professional lineage. Just as those before us, we vow to serve our nation even as racially polarizing issues abound today. From Ferguson, Mo., to Baltimore, Trayvon Martin to Eric Garner, black military members receive regular reminders that our nation is still imperfect—a reality that hits hardest when we are out of uniform and experience racial discrimination. But we also know America can become a more perfect union only if it is protected from threats from other nations and terrorists. After all, the freedom of speech being exercised in the Black Lives Matter movement survives only if the United States can stand strong in the face of challenges from abroad. This is a unique intersection for black service members that make those who have died for our country all the more worthy of recognition. It wasn’t long ago that organizations such as the NAACP had to lobby the federal government to increase black enlistment rates so that all who wanted to serve could do so. Today, black Americans are overrepresented in the military, accounting for 16.5 percent of service members while constituting only 12.2 percent of the U.S. population. Black America’s commitment to military service, like racial progress, has been steady for generations. Of course, service comes with its challenges. The segregation that occurred in the military is well chronicled. And the benefits that went to others who served, such as grants to pay for education and affordable mortgages on preferable terms, were often explicitly withheld from blacks. More recently, controversies over promotion rates and the singling out of blacks in hair grooming policies are a reminder that more work needs to be done. But these occurrences do not undo or invalidate the sacrifices made by blacks in the military for centuries. In fact, they remind us of the necessity and obligation to serve. So on this Memorial Day, all of us should take a break from the cookouts and celebrating the unofficial dawn of summer to remember those who died for our country. But black America, especially, should remember that this commemoration began because we recognized the importance of honoring those who died on the long march to freedom. And most especially, we must remember black Americans who died defending our country so that we can continue striving to make it free and equal for all.